What a finale!!!! But don’t worry, it’s only the mid-season finale and the Walkers will be back in February, so that’s not too terribly long. But tons of stuff to talk about, so let’s get to it…. The last episode left with Rick and the gang sneaking up on Woodbury in darkness….. In early morning you find a man on the run killing walkers. He runs into a woman that he knows. He tells her that they need to keep moving and asks where the others are. She says that they are in a clearing behind her. They are obviously looking for a safe place. She asks about a place to regroup. You then see the rest of their group running together while killing walkers. They go into a clearing and come upon a building. The leaders of the group stop and discuss whether to kill a bitten team member now or wait until she turns. They decide to let her go with them and then go into the building. As the camera fans out you see that the buildings wall has been blown down and that the building one of many behind barbed wire. Andrea is getting dressed and the Governor comes in. She tells him that she is going to help Milton cremate Mr. Coleman’s body.He says that she doesn’t have to if she is still shaken up. She says that all the people in Woodbury are they to help each other in “this mess” The Governor is happy that Woodbury is starting to grow on her. She walks away. He then opens the outer door in his room and turns on the radio. He then opens the cage and Penny comes out when he says “it’s your daddy. She is restrained with a hood on. He takes off the hood and sings to her while she tries to eat him .He tell her to look at him and when she doesn’t he yells “Look at me!! !” at her, kicks over the radio, puts her hood back on and pushes her back into her “cell”. Glen,badly beaten, asks Maggie if the Governor touched her. She said no and says “Being around the walkers the whole time you forget what people can do, what they always done”. She reassures him that she was unharmed and they hug. He gets up and walks towards the dead walker. He pulls off its arm and breaks the arm to get a bone out. Rick and the gang wait in darkness outside Woodbury. Rick, Daryl and Oscar get a game plan for their attack. Michonne leads them in the right direction. The Governor and Merle talk about taking over the prison since its covered on all sides. The Governor wants to take out Ricks group and have the walkers move back into the prison. Merle asks about his brother and the Governor says to talk to him and make him their inside man, wave the white flag. Merle says that nothing happens to Daryl. When asked about Glen and Maggie the Governor says “The longer they are here the better chance Andrea has of finding out” He tells Merle to take them to the screaming pits. 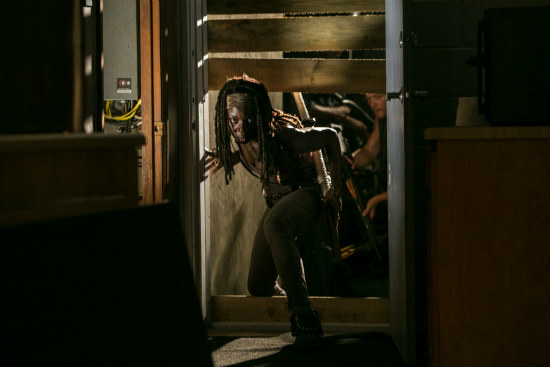 Michonne leads the group into the abandoned building where she was questioned. They see stragglers and think to move due to being “sitting ducks.” She mentions that they could be in the Governors apartments. If they are not they can look somewhere else. Rick told her that she said that she could help her. He walks away and tells Daryl and Oscar that if the plan goes south that they will dump here. They talk about her setting them up or not knowing where to go. During this conversation there is a knock at the door and a man walks in. He says he knows people are in there and Rick comes out, puts a gun to his head and asks where “their people” are. The guy has no clue so Rick gags him while Daryl knocks him out. At the prison the group sits around and waits. Beth is holding judith while Axel watches and starts asking her questions about her family and age. Carol pulls him aside and tells him to stay away from her. Axel talks about how he had been locked up for so long it has been a long time since he has been with a woman and with Maggie being with Glen and him thinking Carol a lesbian he thought he would talk to beth. When Axel finds out that Carol is not a lesbian he turns his attention to her and she shoots him down. Merle and Warren opens the door to Glen and Maggies cell and are shocked at an attack. Maggie slits Warrens throat and when he goes down his gun goes off with Rick and the crew along with other townspeople hearing it. While townspeople run towards the noise, Rick and gang leave the building they are in. Merle pins down Glen and Maggie grabs the gun and points it at Merle. She demands that he lets Glen go and Merle agrees only because other men with guns come in behind her. Merle grabs the gun and demands Glen to get up. Rick and crew sneek into another building. 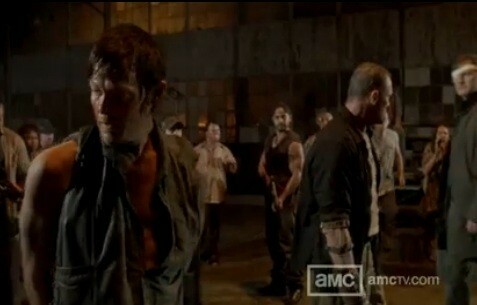 They hear Merle talking to Glen while his men buts sacks over Maggie’s and Glens heads. Rick and Daryl throws tear gas at Merle and in the smoke and gunfire Rick and Daryl get a hold of Glen and Maggie. Andrea runs to the Governor on the street and informs him of the gunfire and she wants to check it out. He says no and a lady calls him to the man who was gagged by Rick earlier. The governor is informed that men with guns are in Woodbury. People around are worried about being under attacked. The Governor sends men to find Rick. Michonne gets the Rick and the group safe into a building and vanishes. Glen tells Daryl that it was Merle that held them and was going to execute them. Daryl asks if his brother is the Governor and Maggie says no but he is his lieutenant or something like that. Daryl asks if mere knows that he is still with the group and Glen says yes. Glen apologizes to Rick about telling where the group is. Rick says its ok and not to worry about it. Maggie states that they need to move and the groups begins to leave. Daryl stops Rick and says that he needs to see his brother. Rick tells him no and when Daryl argues that it is his brother and that he won’t do anything to harm anyone, Rick point out Glen. Daryl wants to talk to Merle and get his help to get the group out of Woodbury but Rick tells him that no matter what they say they hurt Glen and that he needs Dryl to help get the group out. Rick asks if he is with them an Daryl says yes. Merle comes in a gives an update to the Governor and Andrea about what is going on. Merle lies and says that Ricks crew are the ones who killed Warren and that they are here to take over Woodbury. The Governor orders patrols on these “terrorists”. He sends Andrea to go door to door and she argues about how she has experience with a gun and should help with the patrols. The Governor wants her to go door to door since she has some authority and when she argues again he says “Do as I say”. She meekly backs down and says ok.
Michonne sneeks into the Governors room. She is looking for something. She pulls her sword out and sits down in a chair facing the door. Daryl throws a gas bomb outside the building and while it goes out Rick and them leave the building, get spotted by men on the wall and begin a gun battle. Andrea comes out and sees the battle, draws her gun and gets in position to shoot. Rick and Daryl kill the men on the wall and are then surrounded from behind. Andrea fires off some rounds and the Governor sees her and joins her. She says she saw a black man in a prison jumpsuit. Rick and crew run into a safer area to get a game plan and check ammo. They make a plan to make it to the wall. The Governor tells Andrea for them to wait out Rick. She argues and he tell her to get inside. There is now a battle ensuring on all fronts. 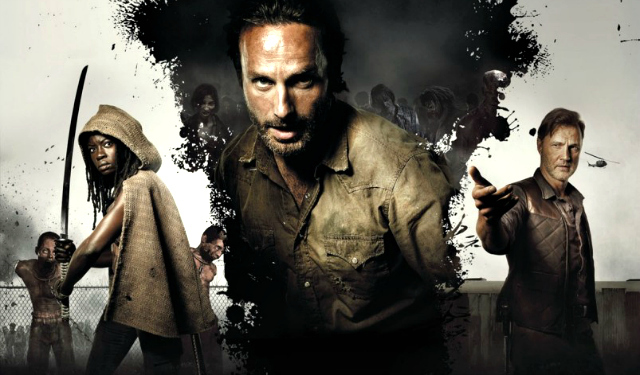 Rick’s crew vs the Governors crew and Andrea (always trying to prove herself to someone) vs. the Governor. Rick sees who he thinks is Shane shoot and hit Oscar (who has made it to the wall) Rick walks to the man and realizes its not Shane, but still confused. Maggie hovers over Oscar and yells for Rick. Maggie then shoots Oscar in the head. At the prison, Carl and Hershel talk about formula. Carl makes a decision to end Carol for formula at the end of the week. Beths tells him that his dad should be back by then and Carl says that you don’t know that. Carl states that Judith is all the family he has left. Then all three hear screaming from inside the prison. 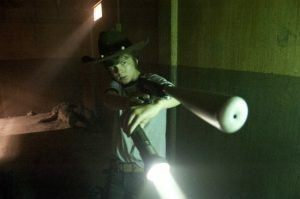 Carl goes to the tombs to check out where the screaming is coming from. He runs into the group from the beginning of the episode, kills a walker and yells at them to follow him. The bitten girl slows them down and Carl yells for them to leave her. The male leader refuses and carries her. Michonne is still sitting in the chair when she hears a noise from behind a door. She kicks it open and walks into the room with all the heads in water. She is looking at the murdered pilots head when she hears another noise from behind the metal cage door. She draws her sword and walks to it. She opens the door and sees Penny. Michonne then sits on the floor and tells her everything is ok and that she will not hurt her. She releases chain from around the neck, pulls off the hood and when she sees that Penny is a child walker grabs her sword to prepare to kill it. The Governor walks in with his gun up and aimed at Michonne and yells “No! !” When Michonne steps behind the girl the Governor says “Don’t hurt her” and puts his gun down. He then takes off his gun belt. Michonne takes her sword and pushes it thru the girls face. The Governor flips and runs towards her and fights her. In the fights the Governor slams her head into an aquarium tank. Michonne pulls down the tanks around her while fighting back. One of the heads from the tank is now laying on the floor and biting at Michonne and the Governor. Michonne gets a piece of broken glass and slams it into the Governors eye. He screams. Michonne gets up to kill him when Andrea comes in with her gun drawn. Andrea asks “What have you done” Michonne and her face off weapons drawn and Michonne circle’s herself out the room and away from Andrea and the Governor. Now there is a Michonne vs Andrea issue. Andrea helps the Governor up and sees the walker heads. The Governor is now crying and holding the child walker. The two groups have now merged in the prison. The bitten lady has now died and when Carl says he will shot her they stop him. The leader of the group is standing over the lady to kill her when Carl locks them in the cell and tells them they have food and will be safe there. When Sasha (female leader) kicks the cell door and orders Carl to open it her companion tells her to stop and let “the man” go. He reminds her that this is the best condition that they have had in weeks and they have stuff to do. He tells Carl that they don’t want any trouble. Beth asks if they should help them and Carl said that they did. The Woodbury doctor tells the Governor that there is severe damage to his eye. He fights her and wants to leave the room. Andread asks the doctor for some alone time with the Governor. Andrea asks him why Michonne was here and the Governor says that she came back to kill him. When Andrea asked hy the Governor said “You tell me. You knew her.” When Andrea asks about the heads he said he looked at them to ‘prepare himself for the horrors outside.” When she asks about Penny Milton and Merle come in and ask what happened and the Governor says he was attacked. Merle says that Rick and his crew made it over the wall and that he will go after them in the morning. Rick, Maggie and Glen make it over the wall. Michonne comes out and the ask her where she was and the with guns on her they take her sword. Rick asks if she got what she came for. She asks about everyone and they tell her that Daryl is still inside the town. When Rick threatens to hurt her if something happens to Daryl she informs him that she brought them to Woodbury safely. Michonne makes a case that Rick still needs her to either help get Darrell back or help get them to the prison. The season has concluded with the beginning of a war between Rick and the Governor. I don’t know how you feel about Andrea, but I personally would not have shed a tear if she had been shot and killed I can’t wait to see what next season has in store for everyone. See you then!! This entry was posted on Monday, December 3rd, 2012 at 12:12 pm	and is filed under Comics, News, Television. You can follow any responses to this entry through the RSS 2.0 feed. You can skip to the end and leave a response. Pinging is currently not allowed. « Geek Deal of the Day! ‘Dark Knight Rises’, ‘Thor’, ‘Star Trek’, and More!! !